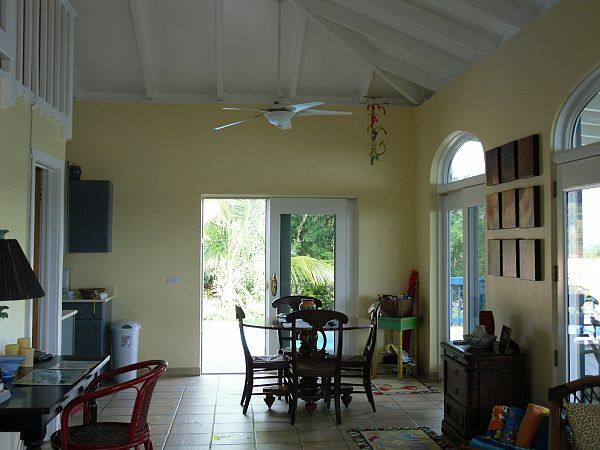 Sun, Moon, and Stars is a 1 bedroom St. John rental located in Coral Bay. Sun, Moon and Stars Villa, named for the amazing sun and moon rises that are viewed over the neighboring islands and the stars that shine overhead will delight couples seeking a lover’s hideaway. 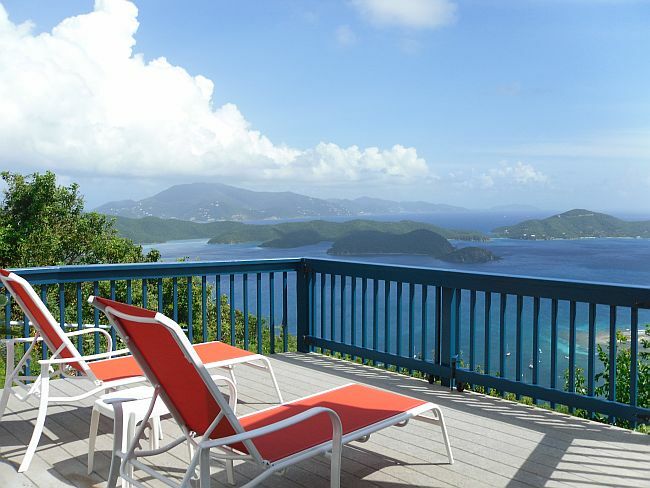 This charming eco-friendly villa commands a fantastic view of St. John’s pristine East End and the many British Virgin islands and cays beyond, all dramatically staged against the vast blue backdrop of ocean and sky. 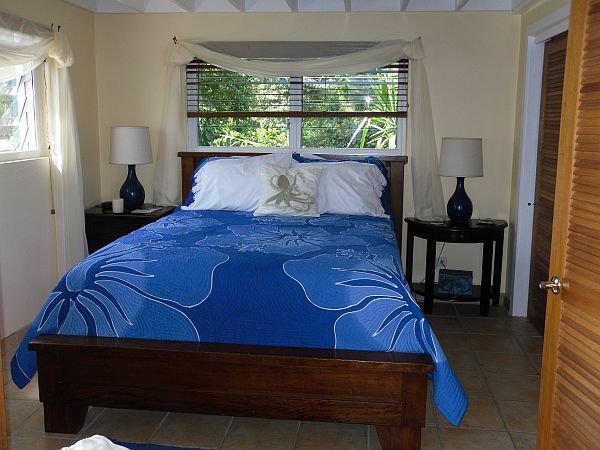 Sun, Moon & Stars Villa is a one-bedroom home just perfect for couples. 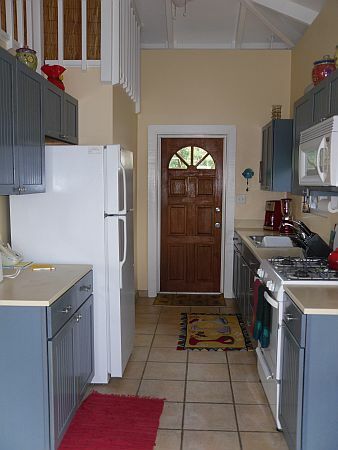 Built all on one level for easy access, this villa offers a well-equipped kitchen and a spacious dining and living area with a cathedral ceiling, and an air-conditioned queen bedroom. 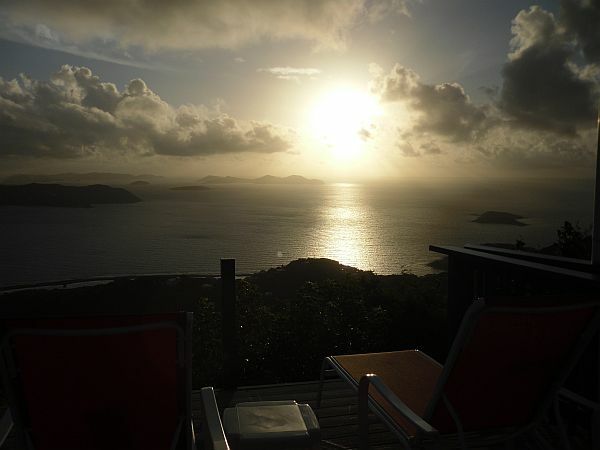 Our home is powered by sustainable solar energy (with public utility backup) to virtually eliminate our impact on the environment and help preserve the natural beauty of St John. French doors open from the living and dining areas to a wide covered verandah which overlooks that unparalleled sea view and catches the cool island tradewinds. 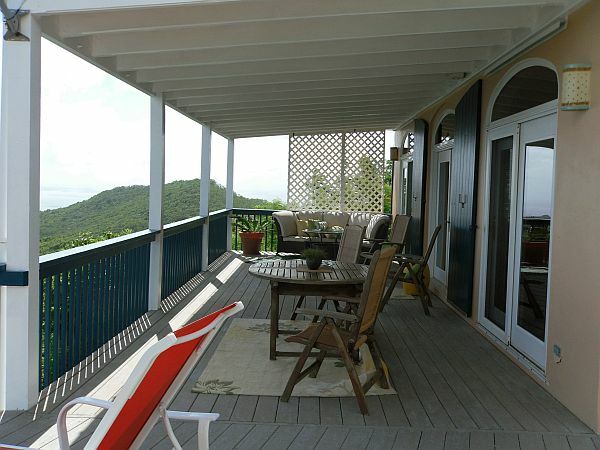 On one side are the secluded solar heated swimming pool and sun deck in a lovely tropical garden setting. Relaxation and a good meal for two go together, so the wide covered verandah is furnished with a cushioned sofa and a table and chairs for alfresco dining; it’s shaded and cool by day and frames the sky at night for romantic stargazing. Private Pool is 11’x20′ with nighttime pool light. Sun, Moon and Stars Villa is located high on a hill above Calabash Boom, reached by a winding country road, so the elevation and the balmy breezes usually keep the temperature at this property very comfortable, and provide the incredible views you’ll always remember. Behind you is National Park land. Four-wheel drive vehicle required. 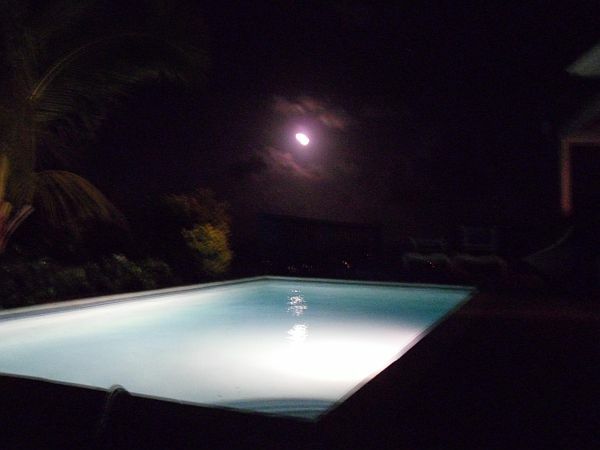 Sun, Moon and Stars Villa is located on the quiet side of St. John, but Coral Bay’s bars, restaurants, and small shops are just a couple minutes’ drive down the road. 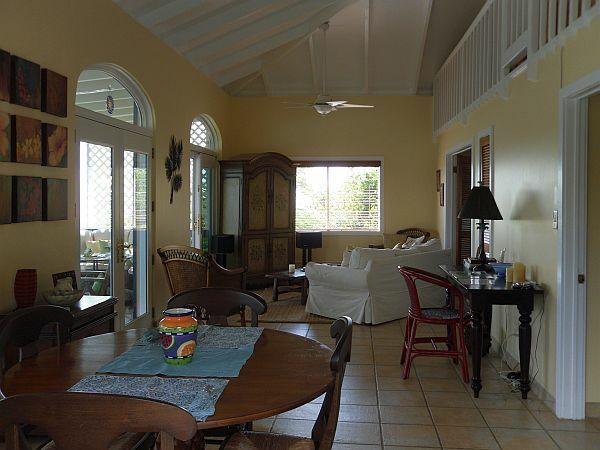 Beautifully furnished in comfortable island style, this lovely and private villa is cozy, welcoming and provides the perfect vacation spot for couples young and old. 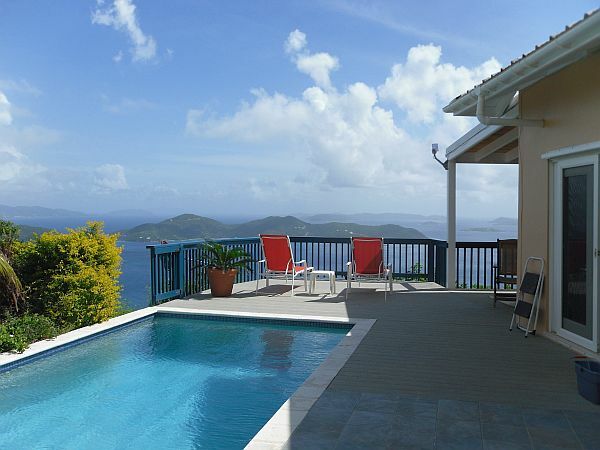 Ocean View is spectacular unobstructed views of seven islands. Enjoy incredible sunrises in the morning and spectacular moon rises and the stars at night. 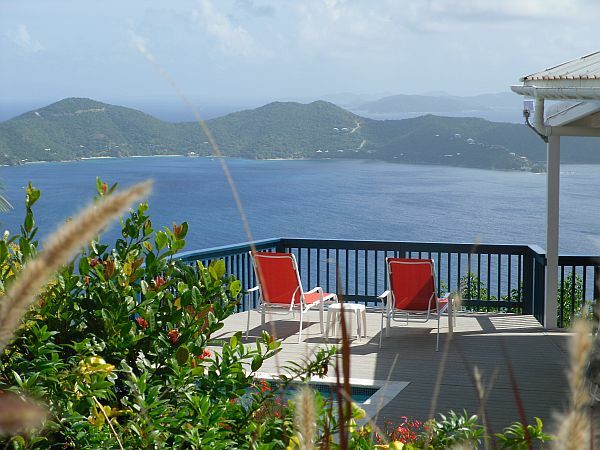 One of the very best views in all of St. John! UV filtration system so water is drinkable. We encourage best offers for Summer and Fall travel. Note until confirmed, rates are subject to change without notice.